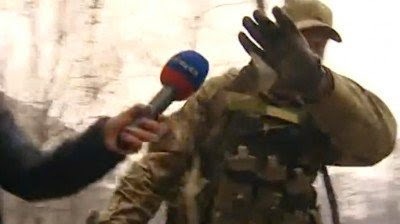 from Russia with love: Ukraine: Military-Clad English-speakers Caught on Camera in Mariupol Shelling Aftermath. Who Are They? Ukraine: Military-Clad English-speakers Caught on Camera in Mariupol Shelling Aftermath. Who Are They? Armed people in uniform speaking fluent English with no accent have been spotted in Mariupol in the aftermath of the rocket hit, fuelling allegations that foreign private military contractors are serving among Ukrainian troops. The port city in eastern Ukraine, under Kiev’s control, saw a surge of violence on Saturday, when several rockets hit a residential area in the east of the city, reportedly killing 30 civilians. Numerous videos from the scene showed destruction in the aftermath of the attack, for which local militia and Ukrainian troops blamed each other. But among footage shot in Mariupol, there are some videos showing armed men in military uniform, who speak English fluently. One video uploaded on YouTube is apparently raw footage of a local news channel MSN (Mariupol News Service). One episode shows a man passing resolutely by the camera. The other piece is longer and apparently shows another armed man in uniform sweeping the area for unexploded munitions. The man behind the camera is apparently a guide, as he speaks in English with a clear accent. But the person he films speaks as if her were a native speaker. “May be exploded, may be not, so blow up in situ,” he instructs at a crater left by an artillery hit. The footage then shows a building with shattered windows signposted as the No 42 kindergarden in Mariupol. The building is in Kiyevskaya Street where the barrage hit. The video description claims the person is an American member of the Azov voluntary battalion, but offers no proof of this. The uniforms features a round blue-and-yellow patch on shoulder, but its details are indistinguishable as is the man’s face. The presence of foreign volunteers among Ukrainian voluntary battalions is no secret. Earlier media reports said many of them have right-wing leanings or even Nazi sympathies. However, so far claims of private military contractors (PMCs) like the infamous Blackwater working in Ukraine remain unproven. Such a presence would indicate a more substantial military support for the Ukrainian government by its foreign backers, since governments usually keep an eye on PMCs working in politically challenging environments. If a Western government didn’t want a PMC to sign a contract with Ukraine, it would find a way to put leverage on it. Finding such specialists complimenting Ukrainian troops would suggest the actual support for Kiev is a tad higher than the purely non-lethal assistance officially offered to Kiev by the West. P.S. The day right before the shelling there wasn't electricity and water supplying in the Vostochny district. Does anybody belive in such coincidence?